Breaking up is hard to do, but for many Facebook users, their friends rally around them to provide comfort immediately after the change in their relationship statuses, according to the final installment in the Valentine’s Day series by the Facebook Data Science Team. For every person in this group, we tracked a combination of the number of messages they sent and received, the number of posts from others on their Timelines, and the number of comments from others on their own content, during a period starting one month before the separation to one month after. The following graph represents the value of that weighted interactions score over time, relative to the person’s behavior before the separation. 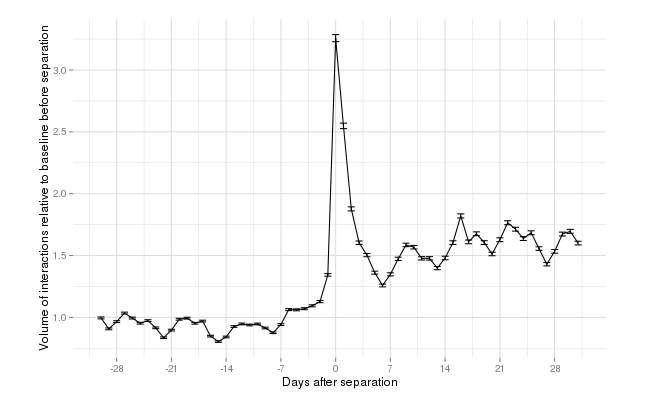 We observed a steady regime around the baseline before the day the relationship status changes, followed by a discontinuity on that day, with a 225 percent increase of the average volume of interactions, which then gradually stabilize over the course of a week to levels higher to those observed pre-breakup. This points toward people receiving support their friends in times where they need it, whether it comes in the form of private messages, timeline posts, or comments. 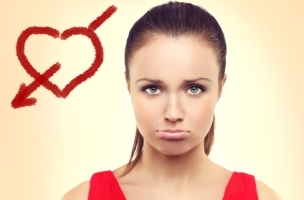 Image of broken-hearted woman courtesy of Shutterstock.